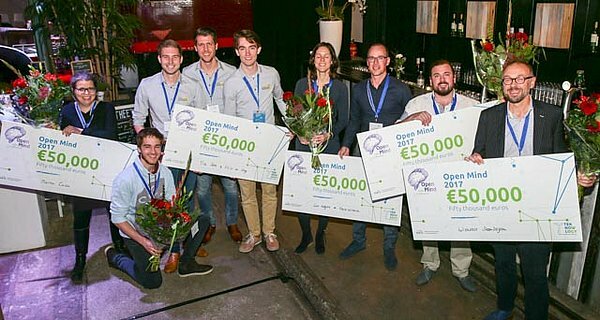 Team SOLID, the TU/e student team that focuses on metal fuels, has won 50,000 euros to further develop their idea. The team is momentarily based on the TU/e campus, but the intention is to move to Metalot Campus in Budel-Dorplein. In SOLID’s project, metal is used as a sustainable energy carrier. When metal powders are burned, heat is released and metal oxides are produced. With the heat, houses can be warmed, but it can also be turned into electricity for trains to run and even ships to sail. Metal oxides from combustion are captured and – using green energy – recreated into the metal powder that it all started with. Thus, a sustainable, closed cycle is created. The team is currently developing a proof-of-principle to demonstrate the operation of the cycle for the metal iron. Iron has an energy density that is many times higher than that of batteries and can easily be stored and transported in large quantities. As a result, metal fuels are in principle suitable for large transport (such as trains and shipping) and stationary applications (such as heating houses, or powering a power plant). In order to further help socially involved researchers, the NWO domain of Applied Sciences and Technology (TTW) offers them a low-threshold grant of 50,000 euros, called Open Mind. This gives them a year to develop their idea. Open Mind is dominated by technology with a surprising social application. Think of Wubbo Ockels who developed a kite that can store wind energy or the floating arms with which the Delft student Boyan Slat wants to collect plastics from the ocean. But it can also be a creative approach to fighting a disease, improving education or communicating more quickly in the event of disasters. In 2017, TTW once again offered researchers who were involved in society the opportunity to submit a proposal for an Open Mind grant. Fifteen nominated teams presented their plans at the NWO Innovation Festival TEKNOWLOGY, on 9 November 2017. There, a jury evaluated the proposals. The five plans receiving the best evaluation were rewarded with a maximum annual research funding of 50,000 euro.